I love maps. I love to pore over a map and figure out the best route to wherever I’m going. I love to look at a map and discover new areas or details with which I was previously unfamiliar. When my wife and I were planning our trip to Germany last summer, I unfolded a large paper map of the country on our dining table. You just can’t beat a physical map’s ability to present a high-level picture of an entire country, showing hundreds (or thousands) of cities and towns, with all of the major interconnecting roads. That map made it simple for us to see which major city with an airport was closest to our ultimate destination, and what kind of driving we’d need to be doing. It proved to be key in planning what turned out to be a flawless trip. The above map includes a statement that many may find surprising: “Nearly 4,000 spaces are available in and outside the Downtown core, including on-street parking.” This statement was true back then, and is even more true today. Of course, one can debate the convenience of much of that parking. For instance, the County Parking Garage is a couple of blocks away from the center of downtown, as is much of the street parking and some of the more remote lots. 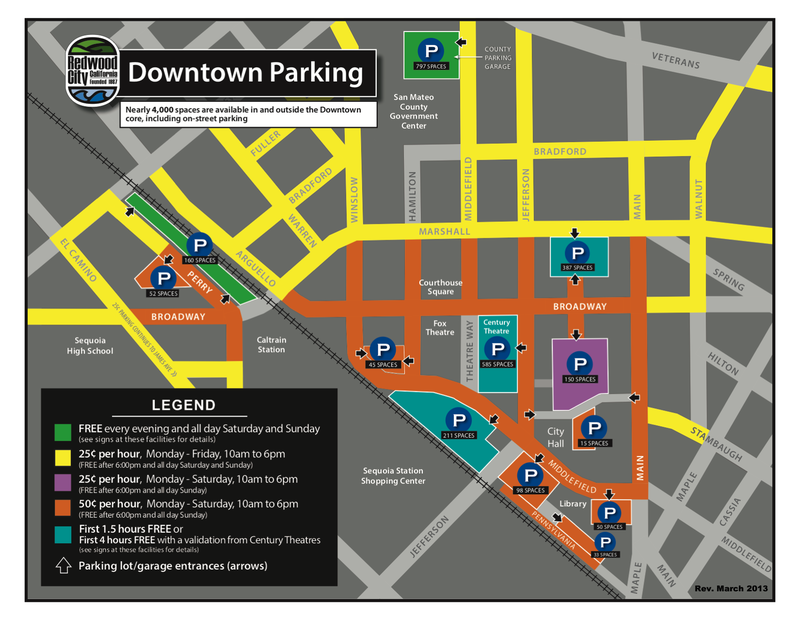 Fortunately, though, a number of the downtown buildings that have been constructed since the above map was drawn are (or will soon be) making their parking garages available to the public on nights, weekends, and holidays, significantly boosting the number of available parking spaces when demand is at its highest. Because it was created in early 2013, that particular map is out of date. The eagle-eyed among you may have noticed that although it is still mostly accurate, the largest surface lot we had back then—the 211-space lot along the railroad tracks at Jefferson—has been replaced by the two brick Crossing 900 (“Box”) buildings. And, of course, the parking rates listed in the “Legend” are no longer accurate. For an updated version with the correct rates and the addition of the Crossing 900 buildings, see the city’s parking web page. This is only a rough drawing, of course. For one thing, I didn’t update the legend: the city’s web page should serve as the proper source for current rates. I’ve added in all of the new buildings that have (or will have) shared private/public parking, showing them in white. I also included the 851 Main Street project, even though it has not yet been approved by the City Council. Partly because the Planning Commission unanimously recommended the project to the Council, I’m pretty sure it will be approved. During the hours of general public use, operators of shared parking facilities may charge an hourly fee, however such fee shall not exceed 125% of the hourly rate of the Jefferson Avenue Garage, nor be less than the hourly rate charged at the Jefferson Avenue Garage. Thus I suspect that these garages will indeed charge for parking, and that the rate will closely mirror the rates at the Jefferson Avenue Garage (the garage beneath the Century Theatres complex). If that’s an issue, be aware that the County Garage is free during non-working hours. 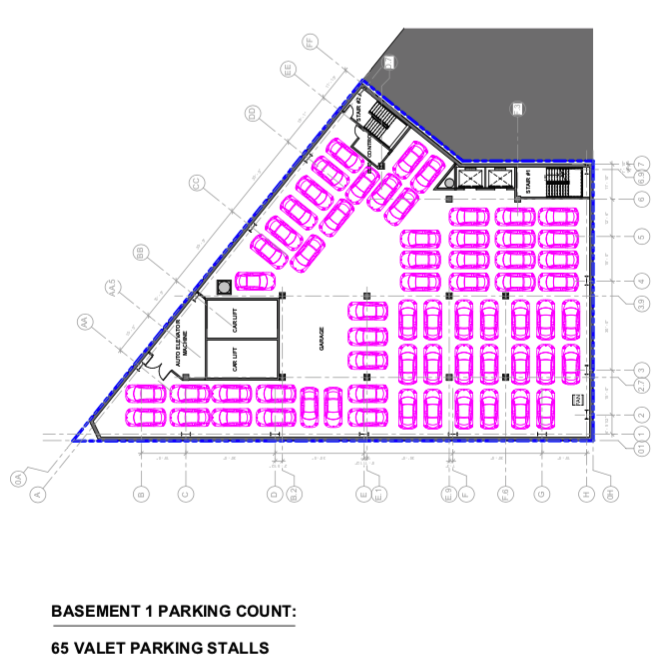 The garages will vary in convenience, based both on their location and on how they are parked. What follows is a run-down on the five new garages (including the Crossing 900 garage). This building is located on Marshall Street between Middlefield and Jefferson, kitty-corner from Courthouse Square. 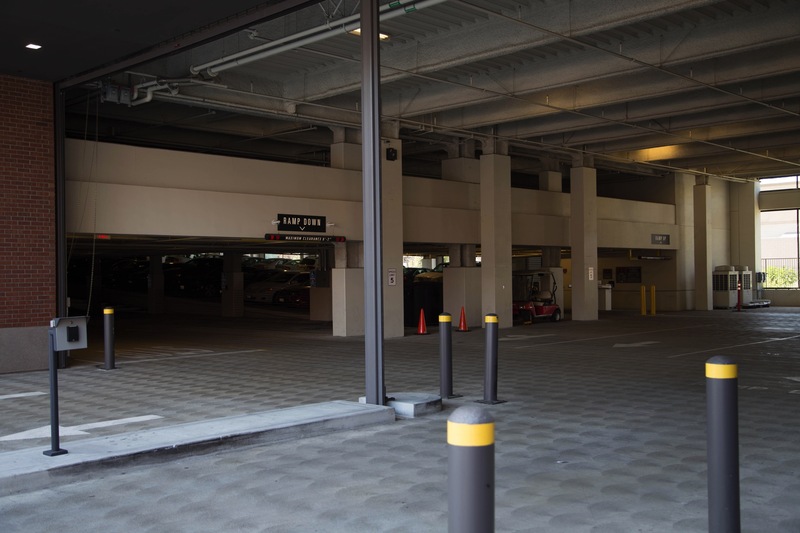 Its five-level, 255-space underground garage (13 of those spaces are for motorcycles) takes advantage of the fact that it spans the entire block, with entrances on both Jefferson and Middlefield. Based upon current signage it appears that after parking pedestrians will exit the garage on the Middlefield side of the building. 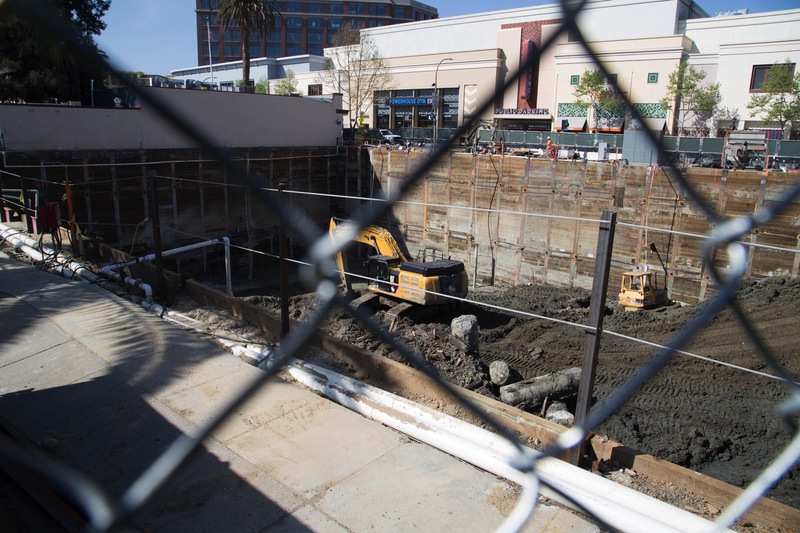 Currently no more than a deep hole in the ground, the building that will rise at the corner of Broadway and Jefferson will accommodate 150 cars in its two-level underground garage. 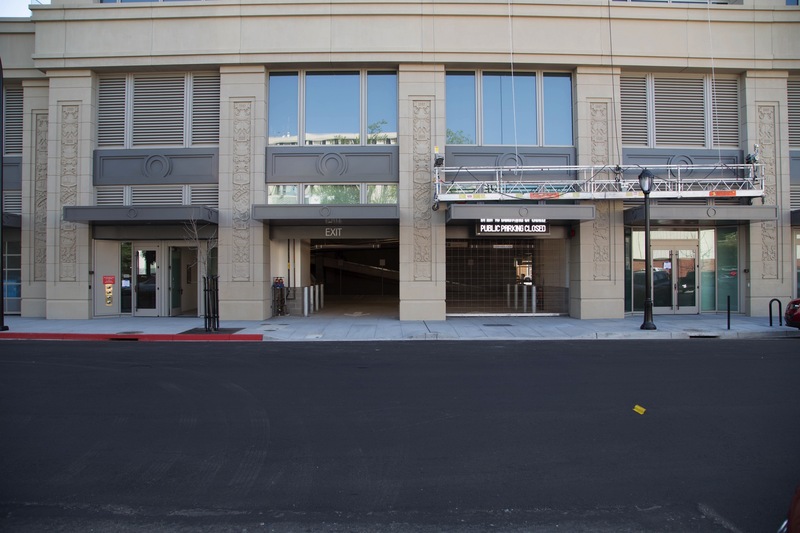 Its garage entrance (and exit) will be on Jefferson, almost directly across from the Century Theatres garage entrance. No valets will be needed here; in the evenings and on weekends and holidays the public will self-park. This building’s convenient location, plus the fact that the building’s ground floor will be a large retail space, should make this garage a popular one. 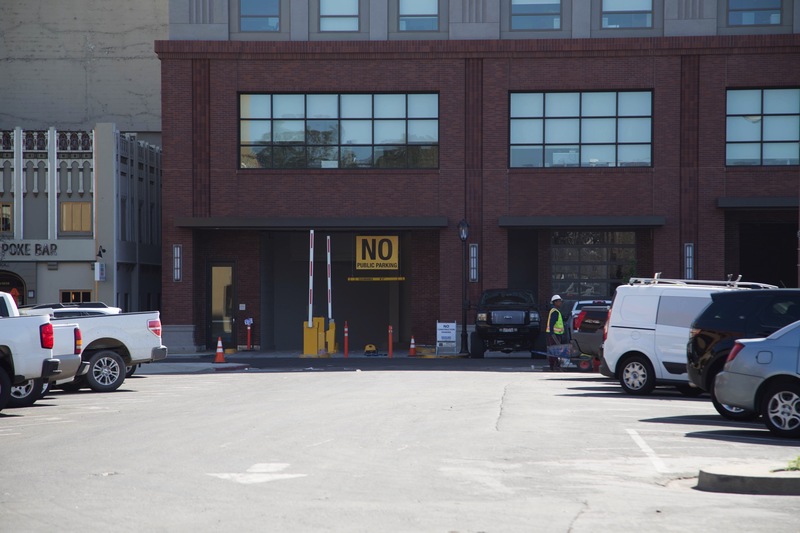 Note that the large “No Public Parking” sign should be temporary and will presumably be removed once the gates are in operation and the garage is open to the building’s tenants (during the day) and the public (the rest of the time). As shown above, 815 Hamilton’s two-level underground garage mates up with the two-level Century Theatre garage. Once the new garage is open to the public, we will be able to drive from one garage to the other using these new access ways, and exit from either. As I mentioned earlier, 851 Main has not yet been approved. Assuming it is, however, and assuming it is constructed along the lines of the plans that were submitted to the city, this building, which will be located between the IOOF Building (where Ralph’s Vacuum & Sewing Center is located) and Angelica’s, will sit on top of a two-level underground garage that can accommodate up to 246 vehicles. 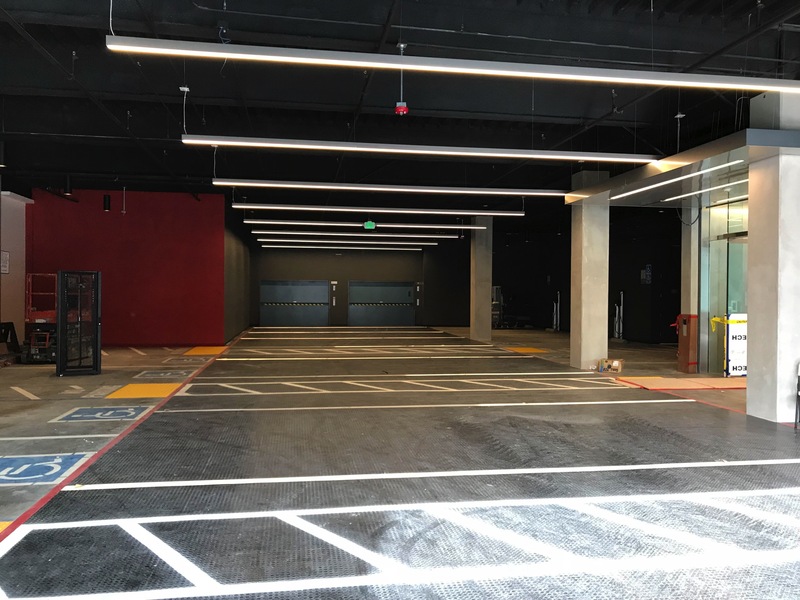 This garage will employ valets, who will operate what is being referred to as an “assisted parking program.” When you drive into the garage’s entrance (which will be on Walnut Street, not Main), a valet will direct you to a parking space. Although you will park your car at the valet’s direction, you will leave your keys. Then, when it is time to retrieve your car, the valet will get it for you. This operation has a high-tech touch: when you are done with your movie or your meal (or whatever), you just text the valet service (or use their dedicated app); they will bring your car up from the garage and have it ready for you by the time you return. From looking at the plans, although your car will enter and exit on Walnut Street, the pedestrian entrance and exit appears to be through the Main Street lobby. This garage should thus be very convenient for those patrons of our great Main Street eateries and shops. We lost a 211-space parking lot when the brick buildings at the corner of Jefferson and Middlefield were constructed, but in their place we gained a parking garage with over 900 spaces that has been open to the public on nights and weekends for some time now. Personally, I find it very handy, especially when going to City Hall, to Courthouse Square, or to the theater. This garage has two below-ground levels and two above-ground levels. After driving into the entrance between the two buildings, you then take one of two left turns: one takes you to the two underground levels, while the other takes you to the two above-ground levels. This garage operates pretty much the same as the Century Theater garage does: take a ticket upon entry (after electing to go up or down, you’ll encounter the machines), and pay before retrieving your car. The payment machine, I should note, is inside the left-hand building; when heading back into the garage, look for the glass doors labeled “900 Public Parking” on your left. So that’s our downtown parking future. Once all of these new buildings have been completed and are fully online, we will have gained close to 1600 new public parking spaces since that first map was drawn. 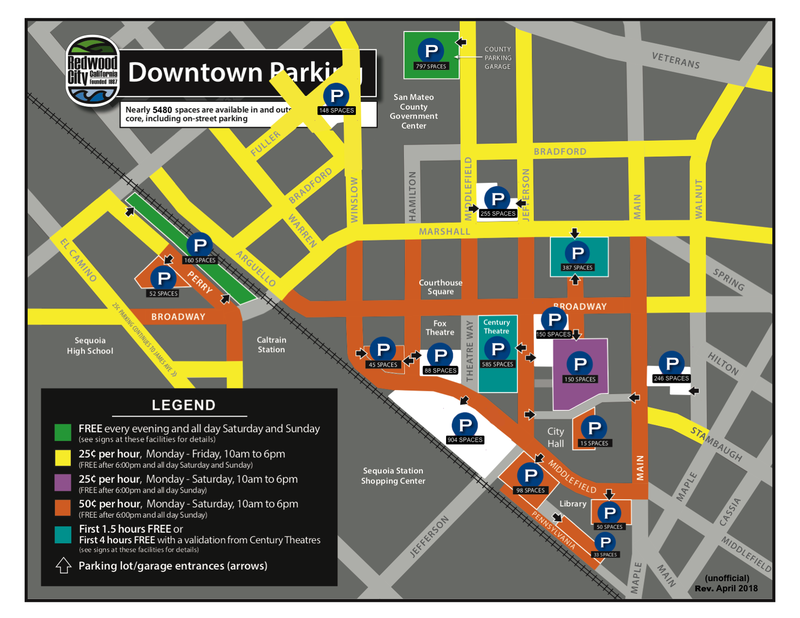 Although these new spaces are only available to the public on nights, weekends, and evenings, as the city has repeatedly noted there are usually plenty of available parking spaces in our downtown during the daytime (hint: always check the Century Theatres garage and the Marshall Street garage; even at lunchtime there always seems to be room). 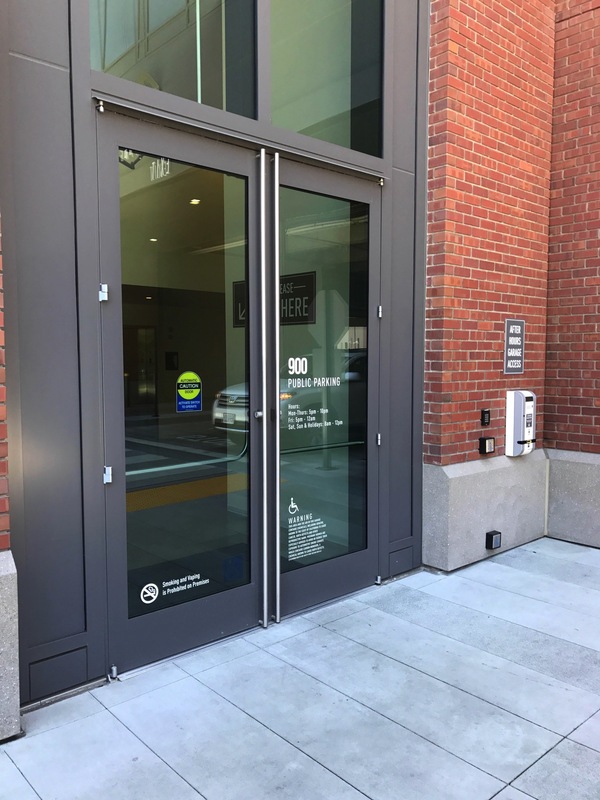 Most, if not all, of these new garages should have electronic signs that indicate the number of available spaces, and hopefully soon we’ll have strategically placed signs throughout downtown directing motorists to garages with available parking. Until those signs are erected, though, I recommend that you familiarize yourself with the parking maps that the city maintains. 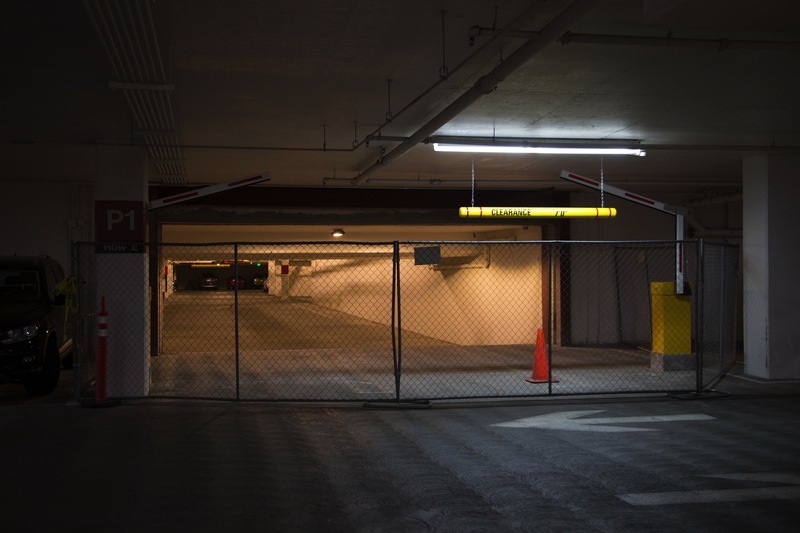 Knowing your way around Redwood City’s parking lots and garages can go a long way towards making your visit a satisfying and successful one.